Puzzles require your client to work on their attention span and problem-solving, which is good for keeping them focused. 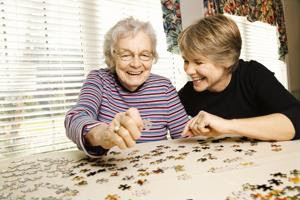 Board games and card games require quick-thinking and energy, so they make for good brain activities for seniors. Crosswords are good for anyone to do to exercise their mind a little. You can do them with your client by reading the clues aloud, or they make large-print versions if your client would prefer to do them alone. Especially for those in the early stages of dementia, sharing memories can be both emotionally and mentally rewarding. Open up a conversation with your client about their childhood, and include more people for a fun sharing circle. If your client has never gardened, learning about the process will help sharpen his or her mind. If your client has gardened regularly before, it's still great because their brain will focus on remembering the plants and procedures involved. Concentrating on the step-by-step instructions involved in cooking is great for keeping the mind working, plus you'll have a tasty treat to eat when you're done!